The Industrial interface RS485 is used for data removal and control of various devices. Typically, the Modbus RTU/TCP protocol is used. About shields for Arduino allowing you to get the RS485 interface I wrote earlier. However, shields are suitable for prototyping, but it makes no sense to use them in the development of industrial automation devices. 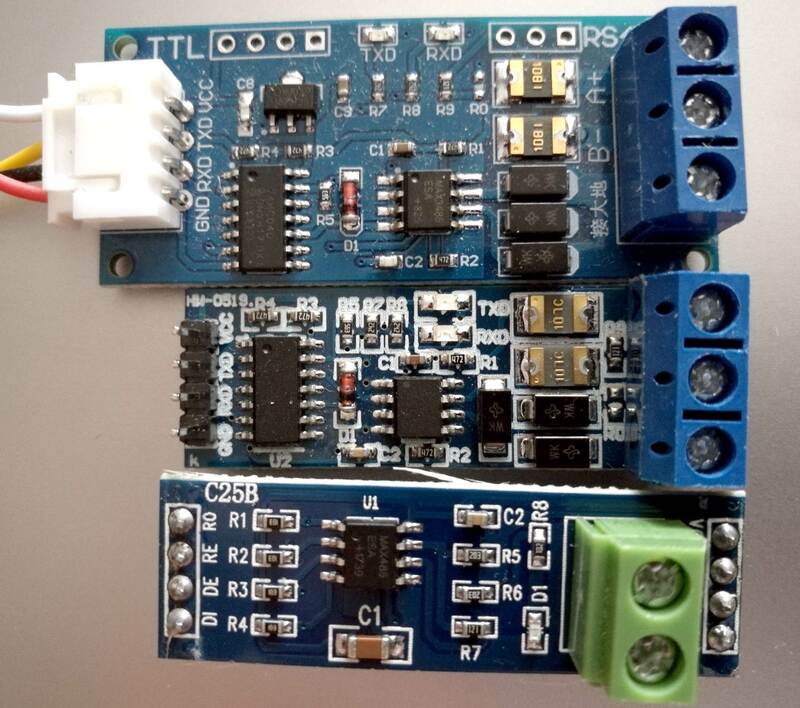 To add support For the RS485 interface to microcontrollers, we turn to Aliexpress again. 🙂 Unfortunately, the search system on Aliexpress leaves much To be desired. It is Not always possible to choose a combination of search words to find the necessary module. Link to find RS485 interface boards in Serial UART. Actually, on Aliexpress of the most inexpensive variants is presented such. The connectors are not broken On it, so you have to order them separately. In General, it is an industrial module for the organization of the RS485 interface on the microcontroller ESP8266/ESP32/Arduino. The Number of its sales on Aliexpress is high and the reviews are good. Protection of 485 tires from lightning strike. Scheme with high noise immunity. Distance to 1000 m.
Protection of the stabilitronom chips from Overvoltage. Supports power from 3.3 V and 5.0 V, which is convenient for ESP microcontrollers which have a nominal voltage of 3.3 V.
Signal Voltage: 3.3 V and/or 5.0 V.
Of Course, all these schemes can be implemented independently, because to purchase a 485 chip that implements the conversion of interfaces can be very cheap. However, all this is a decent work, the time for development of which will not pay off if the developed device is replicated in small batches. For example, a few hundred or even thousands of pieces. In this case, Chinese manufacturers produce a mass product, which is sold by thousands through various channels of sale and they have a price of production is very low. Another version of the converter RS485, but already more expensive and executed at a high technical level. Connectors are broken, from the bottom side there is a wiring diagram, high-quality soldering. Visually, it can be noted that this is a sample from a good manufacturer, though the circuit solution prinitpially nothing and no different from the above option. Learn more about working with these converters with ESP8266 in this article. About how to work with modules paired with ESP32 in the article. Quite a budget version of the module RS485 interface-is a chip MAX485 with minimal "strapping" without any protection from force majeure. It stands in the area of $0.3 apiece. More Profitable to take at once 5 PCs. With delivery from this vendor. A Detailed description of the module connection to ESP8266 in this article. The Connection to ESP32 is described in detail here. Comparison of RS485 modules sizes. Right Aligned. This entry was posted in IT Recipies. Bookmark the permalink.